Advances in Parasitology, Volume 99, the latest in a series first published in 1963, contains comprehensive and up-to-date reviews on all areas of interest in contemporary parasitology. The series includes medical studies of parasites of major influence, along with reviews of more traditional areas, such as zoology, taxonomy, and life history, which help to shape current thinking and applications. 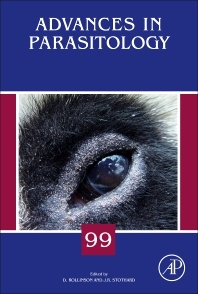 This new release includes sections on climate change and NTDs, Leprosy, parasite cultures, molecular epidemiology of Anisakis and anisakiasis, evolution in triatomine vectors of Chagas disease, expanding the vector control toolbox for Malaria elimination, and parasites of the giant panda.